The Dell PowerEdge T430 packs 2-socket performance in a tower form factor. This entry level system boasts quiet operation, making it perfect for use in small businesses and organizations or branch offices. The T430 is an ideal solution for mail and messaging, file and print serving, or web serving. Aventis Systems offers the T430 in 3 different chassis options for fit your storage needs: 16-bay 2.5", 4-bay 3.5", and 8-bay 3.5". With 12 DIMM slots supporting DDR4 memory, the T430 offers scalability to grow with your business, as well as power savings over systems taking DDR3. The improved iDRAC 8 remote access controller drives better ROI by speeding up deployment and configuration. Customize your Dell PowerEdge T430 tower below! 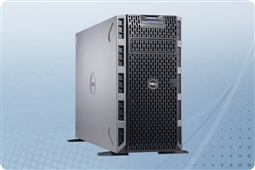 Aventis Systems carries New Dell PowerEdge T430 servers. All servers from Aventis System include a 3 year Comprehensive Warranty, with eligibility for optional Express warranties and onsite services.